From February 2010, Siren Visual Entertainment began releasing remastered versions of the whole ten stories with the option of viewing them either in the English dub or in Japanese with subtitles. Unfortunately, they are still using (or only have access to) those strange versions with the clunky cobbled-together opening credits that some corporate pygmy somewhere decided were more actionful than the original atmospheric sequences. How many times can any sane person sit through those hacked-about scenes from Iga Ninjas which are attached to nearly every story? The subtitling is being done by an American firm and there have been some problems with the accuracy, according to Siren, resulting in delays of some of the stories (most recently Fuma Ninjas Continued) while the problems were fixed. It is good they are now picking these things up because I noticed in the beginning of Iga Ninjas that Sadanobu's speech about why he was really going to Kyoto was hopelessly garbled with Ienari being named as the Emperor! Urgh. The packaging is attractive, giving the box the look of one of the old Scanlen gumcards. Inside each one is a postcard sized b/w photo similarly done up to look like a gumcard. These, like the original set, can be placed back to back to make a (mini) poster. The boxes are more compact than the original release, too. They have begun with Spy Swordsman the very first story not previously released on DVD (or video) here. This was followed in March with Koga Ninjas, Iga Ninjas in April and Black Ninjas in May. June saw the release of Fuma Ninjas but Fuma Ninjas Continued and Ninja Terror won't be out until the end of August. It will be good to have the whole series on DVD, particularly Phantom Ninja, Puppet Ninja and Contest of Death. Prior to this one episode (the first one) from Phantom Ninja and two from Contest of Death were released on video in the mid-90s. There has been nothing from Puppet Ninja at all. Most of the English-dubbed episodes of The Samurai owned by the NINE network have disappeared or been destroyed. They are certainly not owned by NINE anymore. However, about half a dozen are in private hands. For a long time only these were available in this country and only on video until Siren’s releases. In 1990, the two episodes of The Samurai, "A Touch of Death" and "Living Death" were released to video on the Hollywood House label together with brief archive footage of Ōse and fans when he was out here in 1965 plus a peculiar interview with Ōse who spoke no English and an interviewer (Victor Sawicki) who spoke no Japanese. A little later a second volume was released, this time with three episodes, "The Man From Edo" (the very first episode showing Shintarō in full court costume), "The Poison Dart" and "Revenge" from the final story, The Contest of Death. A third volume was released, run off by Sawicki himself with a photocopied cover and sold at the Samurai film sessions in 1993. This had "The Spider" (from Koga Ninjas), "Master Ninja" (from Phantom Ninja) and "Magic Bell" from The New Samurai. Around 1996/97, Manga Live Action (distributed by Siren Films, South Yarra) put out two volumes of Samurai episodes under licence from Galaxy Films. Simply entitled, The Samurai, the first had "The Master Ninja", "Poison Dart" and "Revenge". The second had "Living Death", "The Spider" and "Musai's Curse". Below is an ad for the video and DVD sets of episodes of The Samurai which Siren Visual Entertainment (based in Melbourne) released from 23 Sept. 2002 until Feb. 2006, a total of six stories, namely Koga Ninjas, Iga Ninjas, Black Ninjas, Fuma Ninjas, Fuma Ninjas Continued and Ninja Terror. The first three stories were released on video and on DVD as individual discs; the last three were on DVD as boxed sets only. The three earlier stories were then repackaged as boxed sets of DVDs. In October 2007 Siren announced all Samurai DVDs were to be deleted but even by mid-September the remaining boxed sets they had were all sold out. 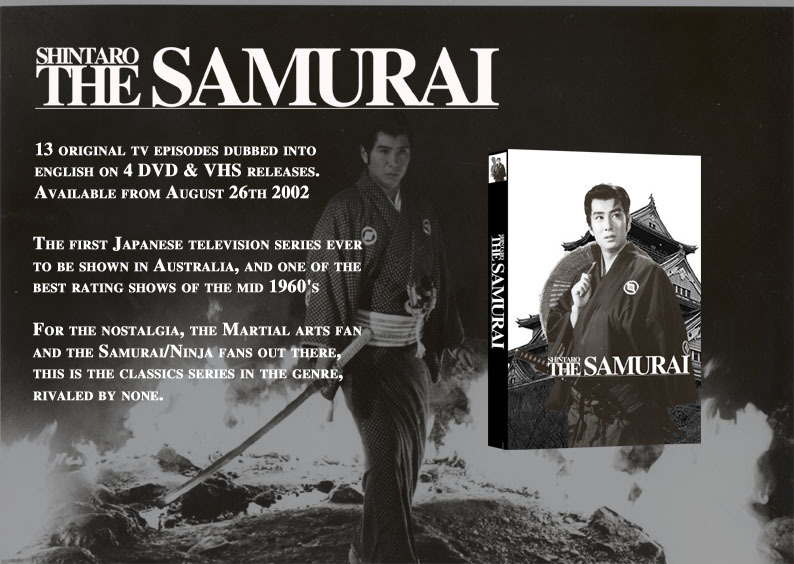 This meant, that unless you came across the boxed sets in a DVD shop somewhere (such as JB HiFi) or found it on eBay, The Samurai was no longer available on DVD. However, late in 2009, Siren announced they would be re-releasing The Samurai on DVD and from February 2010. The Japanese also released two tapes around 1999/2000. The first is of The Samurai, namely the first episode ("Man From Edo" yet again), one from the middle ("The Stolen Case") and the final one ("The Duel"). The second is of The New Samurai and again we have the first episode ("The Search for Kage"), one from the middle ("An Enemy Returns") and the final episode ("The Star Sword"). Needless to say these are undubbed and the format is NTSC, not PAL. In June 2003 they released the whole series on DVD (20 discs in a boxed set). It is now no longer available but it would have set you back Y120,000 or US$1162.68. In April 2004 they released it as separate stories, each costing Y12,00 (approx. Aust.$128) each. Some of these are still available from Yesasia but the more interesting ones (that is, those not released in English by Siren) are out of stock and Contest of Death is listed as being totally unavailable. The discs are Region 2 and in Japanese only.